The HD-9XW is a standard width, extra-tall lift that offers ample overhead clearance and enough side room to park light-duty trucks, SUVs and virtually all low ground-clearance vehicles. When your garage isn’t cramped for space, you have more lifting options. The HD-9XW is made for the garage with a generous ceiling and average room on the sides. Unlike our narrow-width HD-9ST four-post lift, this model comfortably holds wide-body trucks and SUVs without you having to worry about scratching up the mirrors or doors. With 2,082 mm of rise out of the runways, you can lift those heavy machines higher, leaving more room for taller mechanics to operate underneath. There’s also more room to park high-clearance trucks and SUVs. This eliminates the disappointment of buying a new lift and discovering your taller vehicle won’t even fit underneath. The only way to get more width than this is to check out BendPak’s HD-9SW, a super-wide lift. We’re proud to be able to say the HD-9XW is arguably one of our most versatile and user-friendly lifts for serious DIY’ers and shop owners. 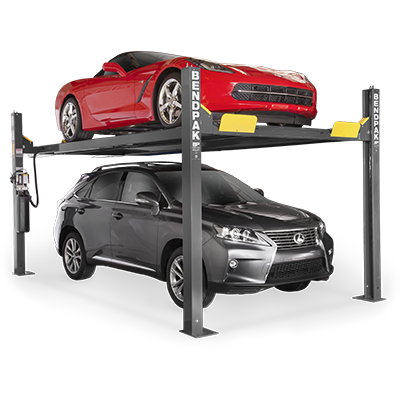 The extra ceiling clearance you need means this car lift is generally the found as the property of daily wrenchers with dedicated service garages. However, if you’re just looking for vehicle storage and want ample space for your lower-level vehicle, this lift is an ideal choice. The HD-9XW is completely certified according to the ANSI/ALI ALCTV-2011 standard. That’s why this lift is seen in shops nationwide and across the globe. There’s no “safer” car lift rating, and only BendPak offers that quality and many other built-in safety features (slack-cable locks, single-point lock release, non-slip runways, magnificent power coat finishing, etc.) with a warranty so good, we trademarked it!